Cable management is one task that for me is bizarrely fun and rewarding. 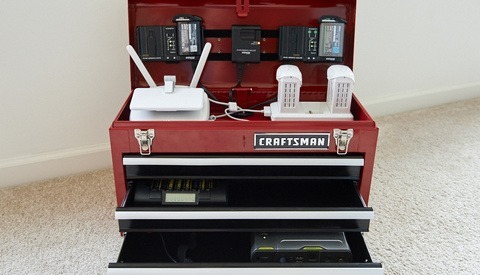 In my last article, I wrote about creating a DIY portable charging station built out of a Craftsman tool box that is serving me quite well in the studio and in the field. Clients have been impressed with the simplicity and intentional design in keeping a lot of gear charged. It communicates quite a bit about how you take care of your investments. Here are a few tips to help you manage the clutter in your office or studio. Recently I added a Cambo stand to my studio and wanted to organize all of the cables running around it. 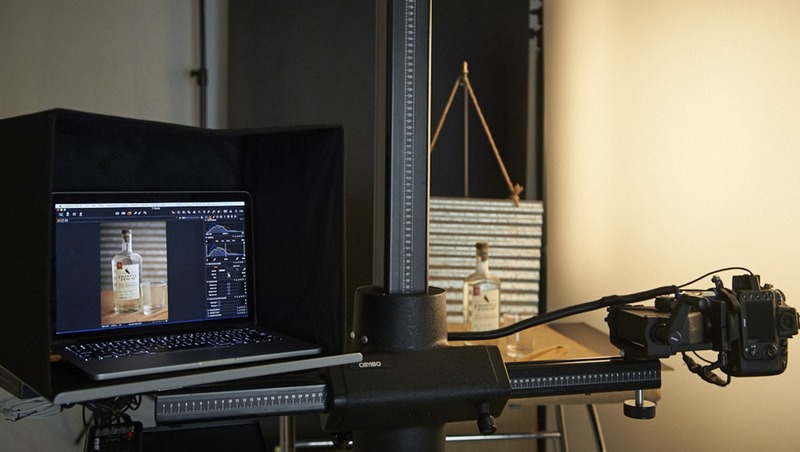 If you've never gotten to use a studio stand or a monostand they greatly accelerate workflow while adding incredible precision and ease. I wanted to add a ton of peripherals to the Cambo stand, from AC powering and USB 3 tethering a Nikon D800E, to powering a MacBook Pro mounted on a Tether Tools Tether Table Aero Traveler, plus a controller for all of my monolights. I love having the flexibility that a studio stand offers yet with all of the peripherals attached to it, it quickly became apparent it needed to be better organized. Cable management would help to minimize reflections and distractions while keeping the movements of the stand free from obstruction. The last time I used a studio stand was about a decade ago. It was a Foba stand and pretty much nothing was attached to it except a camera. Not being sure where to start, I did a quick search online for cable management tools and was overwhelmed with the results. I used to work at Apple where we were maniacal about cable management, especially in retail stores. I remember at new store openings setup was done with Velcro and zip tie placement measured to the millimeter, keeping every cable identically placed across all stores as cleanly as possible. For this project, I ended up at the hardware store as I so often do looking for ideas in physical form and wanted to share the setup with you. Flex tubing is a great solution for running multiple cables together in a sleek yet semi-permanent, unifying fashion. It creates a Borg-like (Star Trek nerd reference) umbilical cord for all of your cables to run through. It is a far cleaner and more organized solution than bundling cables together loosely or with ties. A pre-cut opening extending down the length of the tubing makes adding (or removing) cables simple. If I ever need to remove or route a cable from the flex tubing to run it elsewhere it’s quite easy to do. Zip or twist tie to clamp the ends down to hold the internal cables in place. 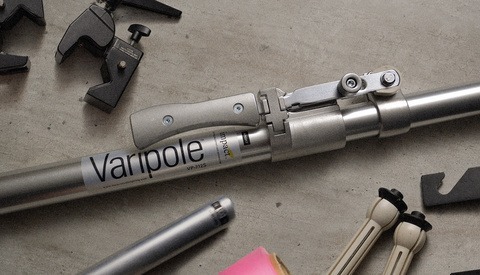 For the Cambo stand, I ended up creating two main sections: one that connected power and the monolights to the Tether Tools table, and a second that connected the table to the camera. That meant when rolling the Cambo stand around on the floor, there is only one main cable to look out for. Because it is a larger cable, it's less likely to get run over. 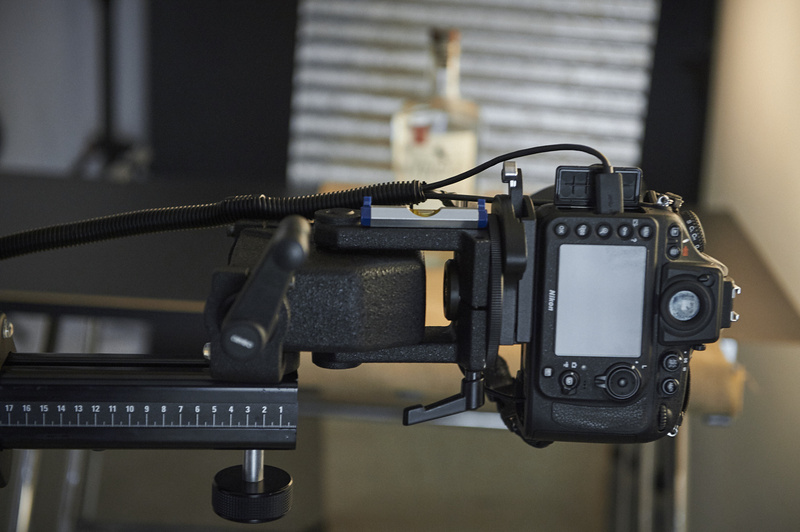 The cable extending from the table to the camera also keeps the stand moving freely. Double-sided tape can be a great solution for attaching a power strip to a surface, but it prohibits modular and removable uses. I prefer to keep gear flexible before fixing something permanently, and industrial strength Velcro is a great solution. There are different strengths available rated by pounds per inch. I covered 25 percent of the underside of my Tether Tools Tether Table Aero Traveler in Velcro to attach power adapters and coiled cables to stay out of the way. It seems there is never enough of this stuff around. Before using the flex tubing, cables were bundled together using Velcro gear ties and twist ties. It didn't look very clean but I kept using Velcro ties to bundle cables together underneath the Tether Tools Aero Table. With the Velcro tape under the Aero Traveler table it was easy to tuck bundles of cables away. How you sort unused cables can be equally as helpful in organizing your equipment. If you work in an office with other people who either share access to cables (or rely on you to handle it all), you really know exactly what I'm talking about. Oftentimes it's not realistic to cut cables to length so I keep an assortment of cables on hand of various lengths using Akro Mills Storage Bins to organize them. Cambo SCH 3-D Gearhead. I added a level to the side of the gearhead for shooting horizontally on the right size. 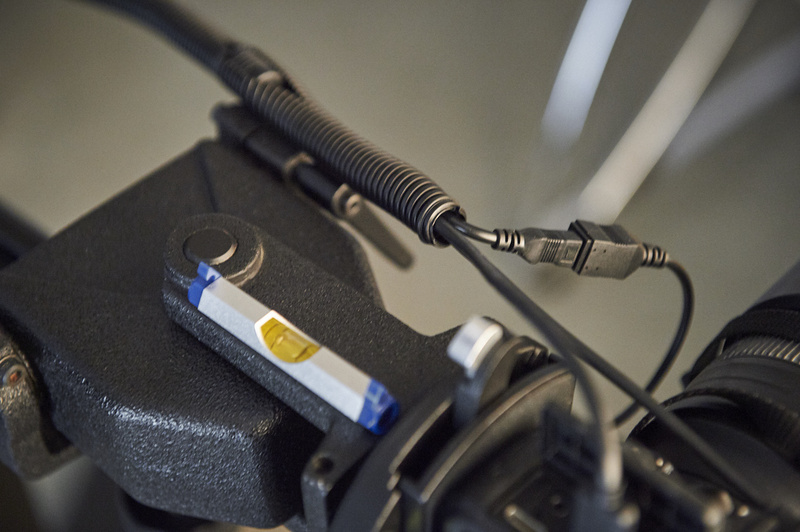 Were the gearhead mounted on the left, the bubble levels on the plate would be more visible. Manfrotto 394 Low Profile Quick Release Adapter with 410PL Plate. I use the D800E in and out of the studio often so this has been really helpful to have, as it pairs with other tripod heads I use. Overall I'm quite happy with this configuration and the studio looks far more intentionally organized now without having cables running all over the place. 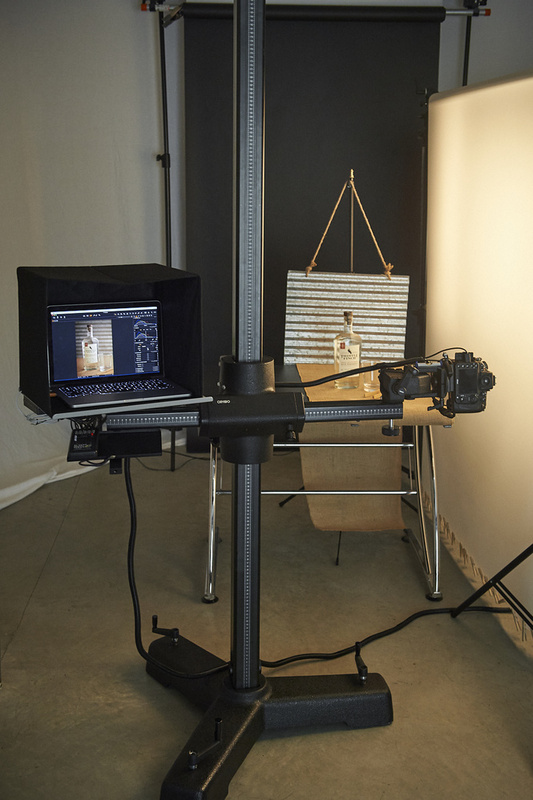 The stand moves freely and quickly, and I find myself trying different angles without worrying about cables running between a separate stands for tethering and the camera itself. 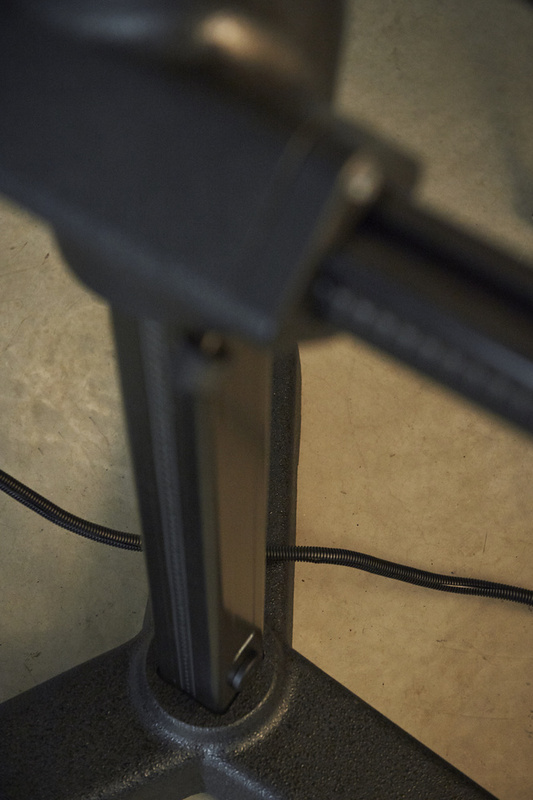 I have a shop stool on wheels that I zip around the studio on and no longer get tripped up on power cords on the floor. What cable management tips do you have? What would you change on this setup? Let us know in the comments below. A good idea if only shooting stills, but if you do any video work with live audio be careful,that convoluted tubing makes very loud crackles if kicked or moved.